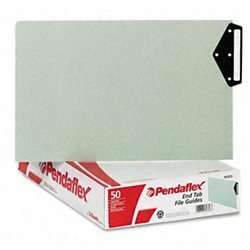 Pendaflex 05353 Green End Tab ..
Pendaflex Green End Tab Guide..
PDF1120: Features: -Pressboard guides.-Ideal for active filing systems.-Long-wearing metal tabs.-Sturdy 25 point pressboard.-50 Pack.-25 point pressboard end tab guides with top position metal tabs.-Manufacturer's lifetime guarantee. Options: -Available in letter or legal sizes. Color/Finish: -Color: Green. Dimensions: -ESS05253 dimensions: 3 H x 9.9 W x 13.2 D.-ESS05353 dimensions: 3 H x 10 W x 15.8 D.
Pressboard guides. Ideal for active filing systems. Long wearing metal tabs. Sturdy 25 point pressboard. 50 Pack. 25 point pressboard end tab guides with top position metal tabs. Manufacturer's lifetime guarantee. Options: Available in letter or legal sizes. Color/Finish: Color: Green. Dimensions: ESS05253 dimensions: 3 H x 9.9 W x 13.2 D. ESS05353 dimensions: 3 H x 10 W x 15.8 D.